Love has no limits. Whether you’re 2 or 92, you’re never too young or too old to find your own slice of happily ever after. One couple discovered this truth when they least expected it. Eighty-three-year-old Lionel Uzé and 78-year-old Evangeline Romero had both been widowed. But their commonalities don’t end at what they lost. They each had plans to stay at Garden View Assisted Living in New Iberia, Louisiana, temporarily. “Mr. Lionel came as a respite stay around June and it was only supposed to be for a couple of weeks,” Community Liason Melissa Vincent told KATC. But this beautiful and caring facility wasn’t the only thing they loved. The two quickly grew feelings for one another — and it all started with a romantic dance. Their love blossomed from there. Romero says she knew “he’s meant to be.” Wedding plans were soon made, despite some reservations from others. “Somebody wanted us to wait and we don’t know how much more time we have left to wait,” Uzé told KATC. The entire community got involved, along with family and friends, helping the couple prepare for their special day. 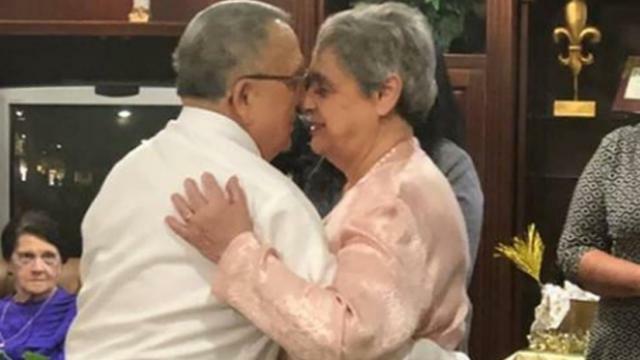 Romero told KATC about her faith, explaining how their meeting didn’t happen by accident. With a custom wedding cake featuring an elderly couple on a swing, the sweet bride and groom met each other at the end of the aisle. Romero was dressed in a lovely blush pink blouse and jacket, Uzé wore a tie and boutonniere to match. “She loves him and I’ve never seen her this happy,” Romero’s daughter said. We’re so glad these two lovebirds found each other. They tied the knot on Jan. 20, 2019. May they live happily ever after.